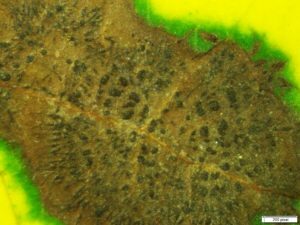 Symptoms: Symptoms of Marssonina leaf blotch appear strikingly similar to Glomerella leaf spot. 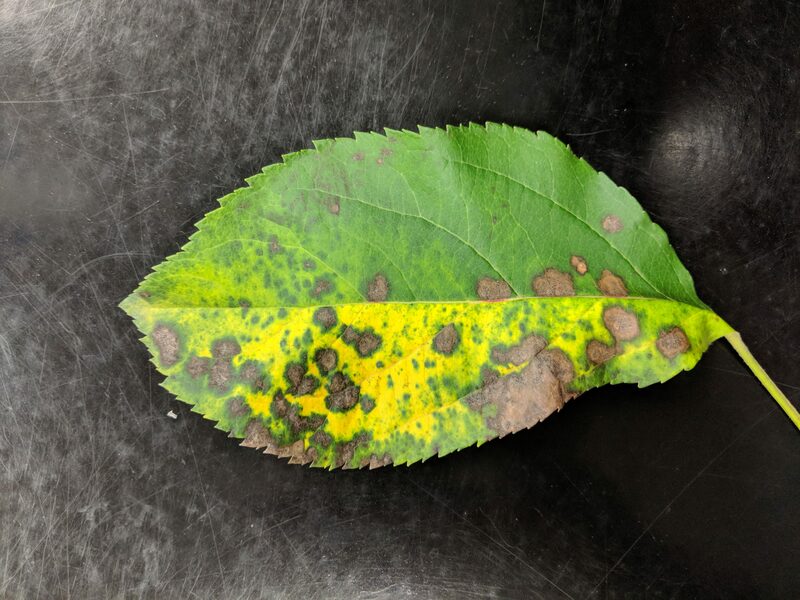 Infected mature leaves have grayish-brown lesions often with purple borders. While lesions associated with GLS may be concentric, we have not observed this characteristic with Marssonina leaf blotch. Like GLS, severely infected leaves become chlorotic (yellow) and defoliate prematurely. Although these more severe symptoms can occur during early summer, we have only observed these advanced stages of this disease over the past few weeks (since early September). Acervuli (small black fungal structures that contain conidia) have been present on several lesions that we have examined. 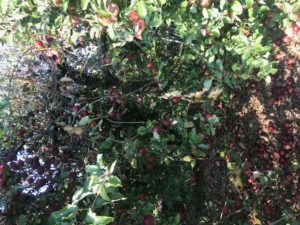 Although fruit can become infected it is uncommon and has not been observed in Western NC. Marssonina leaf blotch on ‘Rome Beauty’. Photo courtesy of Travis Nix. Defoliation associated with Marssonina leaf blotch on ‘Rome Beauty’. Photo courtesy of T. Nix. What Favors Pathogen Infection and Disease Development? Marssonina coronaria overwinters on leaves under the canopy and ascospores (spores causing primary infection) are released around bloom. Rainfall is needed to release these overwintering spores. High humidity and moderate temperatures (68 to 77F) are also required for pathogen infection and disease development. Acervuli of the Marssonina leaf blotch pathogen Marssonina coronaria. What Can Be Done to Prevent Infection Next Year? Cultural control in addition to well-timed fungicide applications should be helpful for managing Marssonina leaf blotch. Cultural management recommendations are the same as I’ve been promoting for GLS. Removal, flail mowing, and/or applying urea to overwintering leaves should reduce the primary inoculum level. Also, consider pruning heavily during the winter and following up with a prohexadione-calcium program to suppress vigor the following season. In regards to fungicides, consider applying cyprodinil (Vanguard), Inspire Super, or a strobilurin (FRAC 11), in tank mixture with a protectant fungicide bloom to 2nd cover and maintaining a protectant program throughout the summer. What Can Be Done Now? Unfortunately, most infections have occurred. 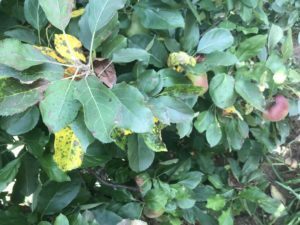 Growers in Western NC that have applied Merivon when symptoms started to appear have observed a slowdown in symptom progression. 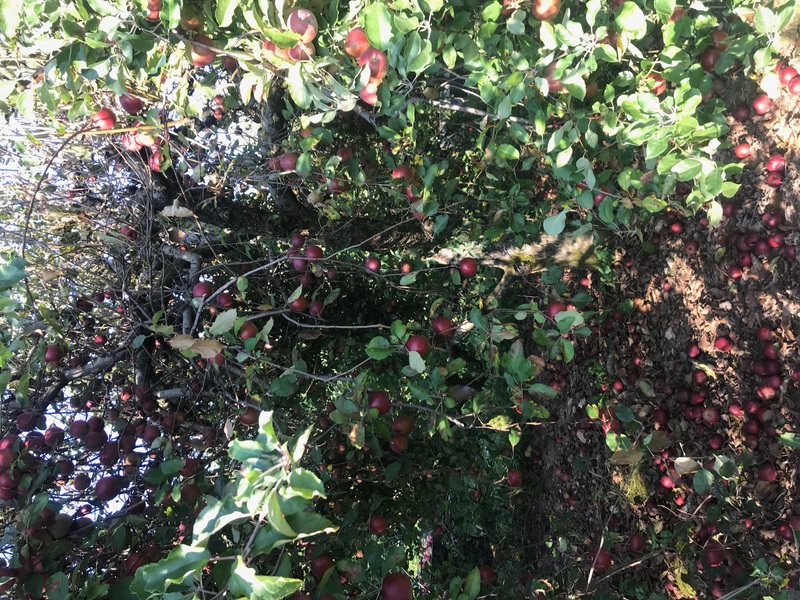 Also, contact me or your extension agent if you think you have Marssonina Blotch in your orchard so that we can get a better idea of its prevalence in the region and also collect some isolates.